Snowmobile Northern Maine along with the Long Lake Sporting Club sponsored the successful world record ice carousel endeavor which hundreds of volunteer Ice Busters achieved on April 7 of last year after they used shovels, chainsaws and augers to dig out a 427 foot diameter circle more than two and a half feet thick and then made it spin. 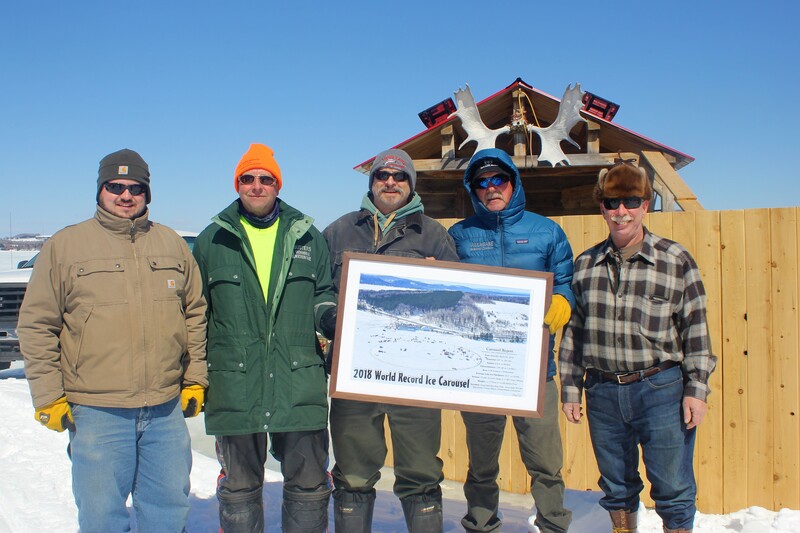 Key members of the Ice Busters gathered on Long Lake on Sunday to celebrate the one year anniversary of a world record ice carousel they helped create there last year. From left: Spencer Caron, Mike Cyr, Ken Martin, Reno Voisine and Dan Daigle. The Ice Busters claimed the world record title from ice carousel enthusiasts in Lohja, Finland, and in doing so raised nearly $8,000 for the Aroostook County Meals on Wheels program, which provides local senior citizens with meals delivered to their homes. The World Ice Carousel Association recognized the record with a plaque that now hangs on a wall at the Long Lake Sporting Club. However, another group in Minnesota, led by the family of the late Sunny Zwilling, topped the feat this January in memory of their loved one, carving a 506.2 -foot ice carousel out of Green Prairie Fish Lake. 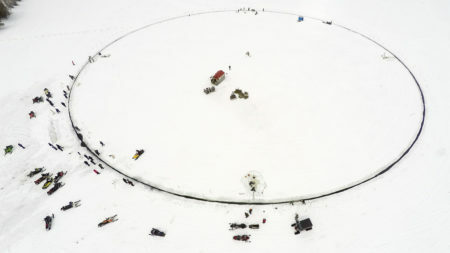 On Sunday, April 7, outside the Long Lake Sporting Club in Sinclair, during a free hot dog roast celebrating the one year anniversary of the world record northern Maine ice carousel, Cyr announced plans to take back the world record in 2020. He said that fellow Ice Buster Roger Morneault of St. Agatha, is designing a specialized piece of equipment to help the team achieve that goal. An aerial photo shows a massive 427-foot diameter circle of ice cut out of frozen Long Lake in Sinclair on Saturday, April 7, 2018. “He’s working on building a machine guided device that will cut the ice for us,” Cyr said. 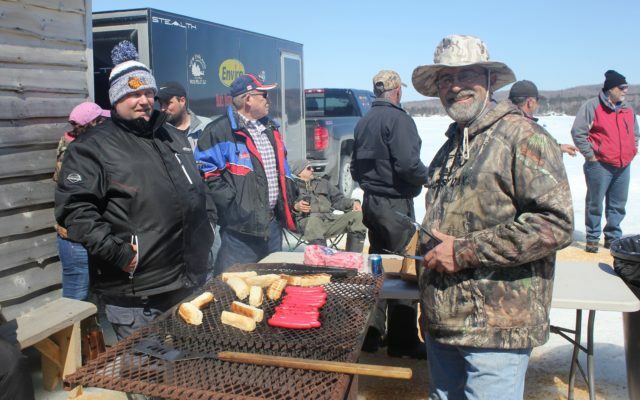 Cyr expressed his respect for the accomplishment of the Zeilling family in breaking the Ice Busters’ record, and in fact wore a hat with the Zelling family insignia to the hot dog roast on Sunday. The Minnesota group, on their own Facebook page, expressed support and appreciation for the Ice Busters that same day. Although the international ice carousel enthusiasts are supportive of one another, they are also secretive when it comes to strategy. Cyr declined to state what the new size goal will be in terms of the Ice Busters’ plan for a 2020 carousel. 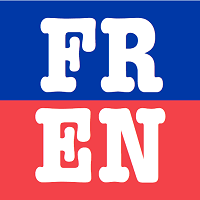 “We’re not saying how big it’s going to be; we plan to announce it at the last minute,” he said. Cyr did say that the group plans to construct its ice carousel between March 20 and April 20 of next year, depending on the weather, and that the group plans to continue supporting the Meals on Wheels program with that endeavor. To follow the Ice Busters, visit the Snowmobile Northern Maine Facebook page.